Every March, the National Education Association (NEA) celebrates the many reasons reading is important, and why diverse books matter. “Read Across America” is a nationwide reading celebration held on March 2 (and throughout the month) in conjunction with the birthday of Theodor Geisel...known the world over as Dr. Seuss! 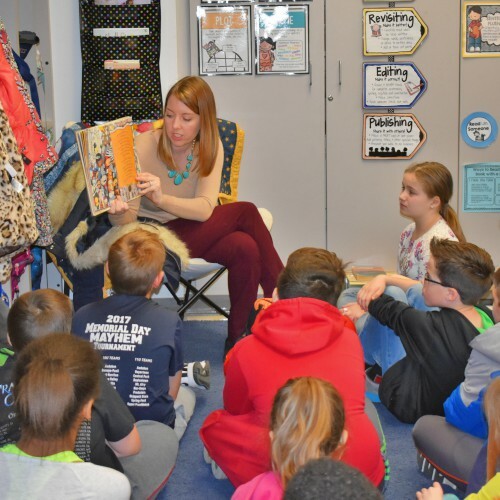 The Upper Perkiomen School District was one of thousands of schools, libraries and community centers to participate in “Read Across America” by bringing together kids, teens and books. Upper Perk schools hosted a variety of “Read Across America” activities. At Hereford Elementary, during the first two weeks of March, dozens of guest readers read the works of Dr. Seuss and other acclaimed authors to classes. Mystery readers included community volunteers, retired teachers, school board members and members of the UPSD administration. Pictured are (top to bottom): George Reigle, Director of Pupil Services & Special Education, reading to Mrs. Gruber’s class; Allison Stephens, Technology, Curriculum, Innovation Specialist, in Mrs. Keller’s classroom; and St. Luke’s volunteer Susan Wade reading to Mrs. Wilson’s class. Hereford readers were coordinated by reading specialist Amy Miller in conjunction with classroom teachers and volunteers from St. Luke’s Hospital in Quakertown. For Dr. Seuss’ birthday on March 2, Marlborough Elementary held a school-wide “Drop Everything and Read” event, and first graders celebrated that entire week with silly days. Marlborough also planned a week of related festivities for the entire school starting March 19, complete with crazy sock day, tie dye shirt day, favorite book character day, crazy hat day and crazy hair day. During the week of February 26, the middle school featured a number of “Read Across America” events, as well. A book was read aloud over the announcements each morning, and a classroom door decoration contest was held, with the theme “Knowledge is Power.” The top two readers from each team were also invited to participate in a birthday party for Dr. Seuss on March 2. The entire week was a spirit week, with themed days including famous duos and heros/villains. You can find out more about “Read Across America” on the NEA’s website and Seussville.